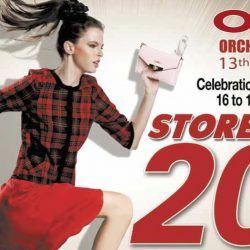 16 - 19 Mar 2017 OG Singapore: OG Orchard Point 13th Birthday Celebration Storewide 20% OFF at All Stores! Enjoy storewide 20% discount on most brands' regular-priced items at all OG stores in celebration of OG Orchard Point's 13th birthday! Head on down to your nearest OG store now for some retail therapy! Enjoy storewide 20% discount on most brands' regular-priced items, and up to 70% off a wide variety of items at all OG stores! Good till 19 Feb 2017! Head on down to your nearest OG store now for some retail therapy! As the Lunar New Year approaches, it's time to update your look for a more beautiful New You! From 12 to 15 Jan 2017, if you are an OG Card member, you can save 20% on Prestige Beauty Brands. Non-members will receive 15% off by OG Rebate Voucher. PLUS, from 12 to 22 Jan 2017, all shoppers can enjoy 20% off regular-priced general brand cosmetics, toiletries and health supplements! We’re already into December and the festivities have begun! Be it for home parties or the get-togethers with colleagues and business associates, you’ll find delightful essentials now at OG with 20% off storewide from now till 4 Dec 2016. If you are an OG Cardmember, you'll get an extra 10% off* Menswear! *From now till 2 Jan 2017. It's never too early to get Christmas shopping done! Head to OG to shop with their 20% off storewide sale! Now till 20 Nov 2016. You’ll surely find something suitable for your loved ones and even yourself! Start your happy shopping now! The long-awaited OG Anniversary Sale is here! Come on down to any of the OG stores to enjoy the numerous storewide offers including 20% off most brands’ regular-priced items from now till 28 August 2016! Want to enjoy the privileges of membership? This is the only time to get the exclusive OG Member Privilege Card! Simply spend $75 nett on the same day from now to 2 Oct 2016 and you can sign up for the card. It's that simple! Wait no more - Hurry down to OG stores to begin shopping! 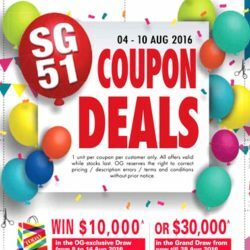 Celebrate SG51 with OG! Enjoy 20% off storewide on most brands regular-priced items at OG from now till 10 August 2016. 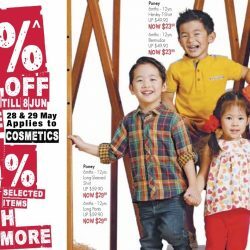 Also enjoy up to 51% off selected kids, toys, beauty, health, wellness products with coupons! Take advantage of this special OG Exclusive deal! Simply spend $50 nett storewide and be entitled to purchase one of item at PWP price. Now to 31 August 2016, while stocks last. 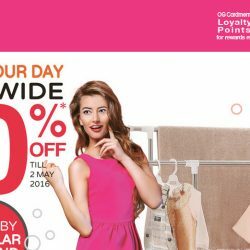 Don’t miss your chance to enjoy great savings at OG's GSS 20% off storewide sale on most brands regular-priced items and up to 70% off selected items from now to 8 June 2016! 20% discount is applicable to cosmetics on 28 and 29 May 2016. C'mon down to OG Albert, OG Orchard Point or OG People’s Park! It's time to begin prepping for your mid-year vacation! Enjoy 20% off regular-priced winter wear & luggage of most brands, plus exclusive special buys only at OG! Now till 18 May 2016 only. We've got a great treat for the Labour Day long weekend! Enjoy 20% off storewide on most brands regular-priced items at OG from now till 2 May 2016. 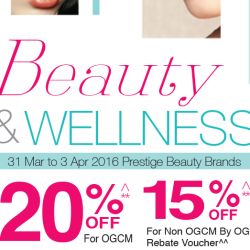 You can also save on prestige brand cosmetics on Sat 30 Apr and Sun 1 May! 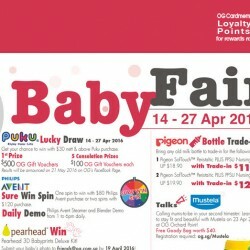 Mummies and Daddies, dun miss OG's Baby Fair from 14 to 27 April 2016! Enjoy up to 30% off all regular-priced baby accessories and apparels plus additional 10% off all Avent/Puku/special offer items and Combi baby equipment! Get beautiful inside out with OG's much-awaited Beauty & Wellness Fair! Enjoy 20% off Prestige Beauty Brands if you are an OG Card member or 15% off by OG rebate voucher if you are a non-member. From today till Sunday 3 Apr only. All shoppers can pick up 20% savings on general brand cosmetics, toiletries and health supplements from now till 10 Apr 2016! Take this time to stock up on your favourite health and beauty products! We'll see you there! 17 - 20 Mar 2016 OG: 20% OFF Storewide at All OG stores! Celebrate OG Orchard Point's 12th Birthday with a 20% off storewide on most brands regular-priced items, from 17 to 20 Mar 2016 at all OG stores! Hurry down to your nearest OG store now to enjoy this exclusive deal! Celebrate OG Orchard Point's 12th birthday on 15 and 16 March 2016 with a private sale exclusively for members and guests only! Get up to 20% off plus an additonal 10% off sale items at the sale. Remember to bring your direct mailer with the admission tickets or the OG Member Card for admission! 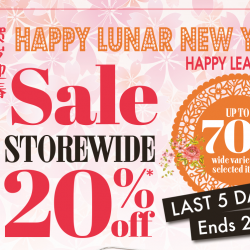 It's the final 5 days of OG's Happy Lunar New Year / Happy Leap Year sale! 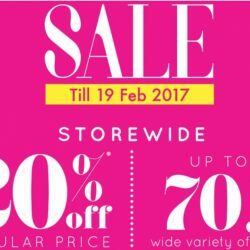 From now to Leap Day 29 Feb 2016, enjoy storewide 20% off most brands regular-priced items and up to 70% off a wide variety of selected items. Happy shopping! 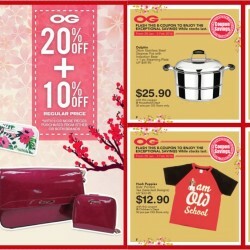 Continue the joyous festive celebration at OG with their Happy Lunar New Year and Happy Leap Year sale! From now to Leap Day 29 Feb 2016, enjoy storewide 20% off major brands regular-priced items and up to 70% off a wide variety of selected items. We'll see you there! 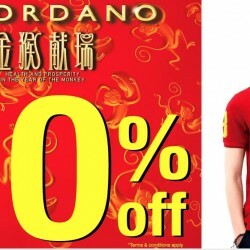 Giordano's OG Albert atrium sales up to 70% off! Sales ends on 17-Feb. Terms and condition apply. Still looking for that special handbag or wallet to match your Chinese New Year outfit? From now to 07 Feb 2016, enjoy 20% + 10% off regular-priced Pierre Cardin or Renoma women's handbags and wallets, with 2 or more pieces purchased at OG stores! You can even combine an item from either brand to enjoy the discount! 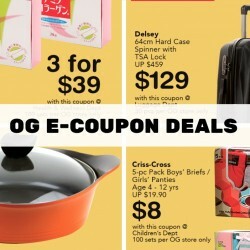 Also enjoy extra savings with coupons for your last-minute CNY shopping! Valid till from now to 3 Feb 2016 while stocks last. On Fridays to Sundays, until 18 Feb 2016, spending with your AMEX card at OG gives you a 10% rebate voucher. So, head on down to your nearest OG outlet to enjoy this deal! Happy shopping! It’s a brand New Year, so get into the routine to become a more beautiful New You! Get the latest range of beauty and wellness products that’ll help you achieve desired results at OG! 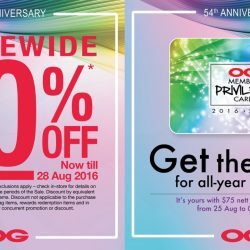 From 28 Jan to 31 Jan 2016, save 20% on Prestige Beauty Brands if you’re an OG Card member while non-members will receive 15% off by OG Rebate Voucher. 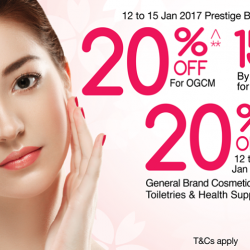 And, from 28 Jan to 7 Feb 2016, all shoppers can enjoy 20% off regular-priced general brand cosmetics, toiletries and health supplements! 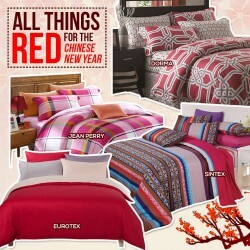 New bedsheets in Red signify a fresh, new prosperous start for the year, ensuring bountiful fortunein the home. Head down to OG stores for more vibrant selections of beddings that will fit your home! From 14 to 20 Jan 2016, head down to OG stores to enjoy your CNY shopping with these great coupon savings. Offers are valid while stocks last. Happy New Year! 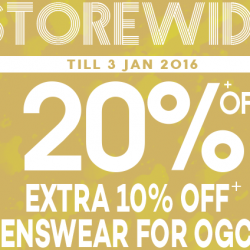 Say hello to 2016 with OG's storewide 20% off sale from now till 3 Jan 2016! 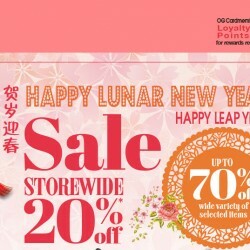 It's an opportunity to start shopping for the upcoming CNY celebrations and, if you are an OG Card member, you will get to enjoy an extra 10% off menswear! So, see you there! Ho, ho, ho - Merry Christmas! 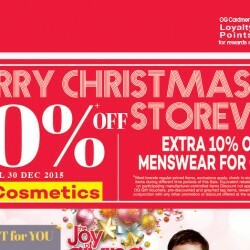 From today till 30 Dec 2015, enjoy storewide 20% off most brands regular-priced items at OG! Looking to get a new shade of lipstick? The storewide 20% off will also be applied to Cosmetics today and tomorrow! If you are an OGCM, you'll get to enjoy an extra 10% off Menswear! Christmas is just less than 2 weeks away. 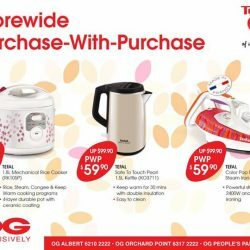 Hurry get started or continue on your Christmas shopping at OG now, and enjoy 20% OFF storewide on most brands regular-priced items from today to Sunday, 13 Dec 2015. And if you're an OG Card member looking to get something for guys, you'll get to enjoy an additional 10% OFF on regular-priced menswear. It's simply the joy of giving at OG. This family-friendly department store is celebrating its 53rd anniversary in 2015. One of the oldest in Singapore, it is also catered more to family and matured shoppers. 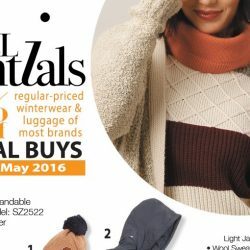 They carry the standard merchandise from beauty products, footwear, apparel, luggage, and homeware, with a focus on kitchenware. Nothing exciting, however, sales are quite frequent so you can find a good bargain now and then.Keep updated on their sales at BQ.sg.